Aaaargh! Shrinkaaaage! I need a new top coat. Also a better gold for stamping. Revlon Gold Coin is just not cutting it; it's a little too grainy. 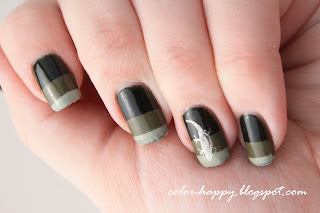 I used NYC Flat Iron Green, Zoya Dree, and Sally Hansen Nail Growth Miracle Creamy Olive. Flat Iron Green needs at least three coats if worn by itself. I did two because I knew I'd be covering the tips anyway. I keep forgetting how gorgeously buttery smooth Dree goes on. It's like nail polish perfection. Creamy Olive is a little disappointing. The color is a little odd: kind of a slightly yellow green with a lot of gray to it. Almost more gray than green. The brush is flat and very wide with coarse bristles, so it doesn't hold on to the polish very well and makes for awkward and messy application if you're trying for thin, even coats. Definitely not one of my favorites.